It seems I skipped too many chapters in Feynman’s second volume of Lectures (on electromagnetism) and so I have to return to that before getting back to quantum physics. So let me just do that in the next couple of posts. I’ll have to start with the basics: Maxwell’s equations. Indeed, electromagnetic phenomena are described by a set of four equations known as Maxwell’s equations. 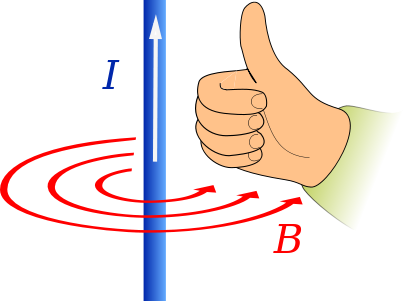 They relate two fields: the electric field (E) and the magnetic field (B). 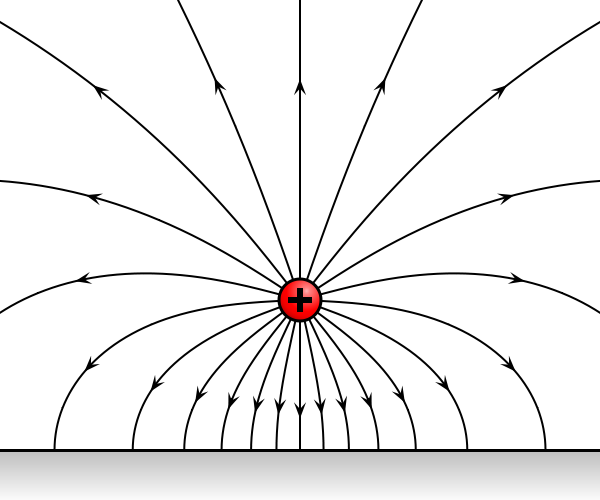 The electric field appears when we have electric charges: positive (e.g. protons or positively charged ions) or negative (e.g. electrons or negatively charged ions). That’s obvious. In contrast, there is no such thing as ‘magnetic charges’. The magnetic field appears only when the electric field changes, or when charges move. 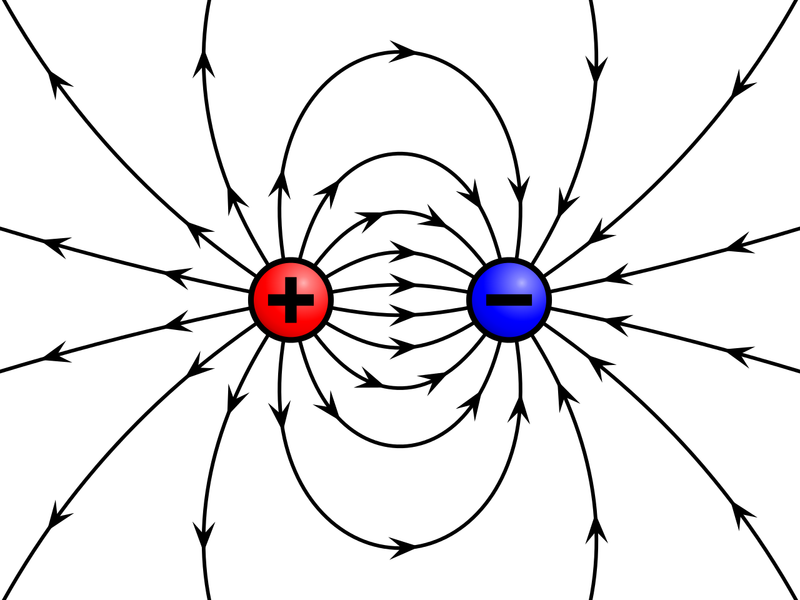 In turn, the change in the magnetic field causes an electric field, and that’s how electromagnetic radiation basically works: a changing electric field causes a magnetic field, and the build-up of that magnetic field (so that’s a changing magnetic field) causes a build-up of an electric field, and so on and so on. 1. From Maxwell’s equations, we can calculate the magnitude of E and B. Indeed, a specific functional form for E and B is what we get when we solve Maxwell’s set of equations, and we’ll jot down that solution in a moment–even if I am afraid you will shake your head when you see it. The point to note is that what we get as a solution for E and B is a solution in a particular frame of reference only: if we switch to another reference frame, E and B will look different. Huh? Yes. According to the principle of relativity, we cannot say which charges are ‘stationary’ and which charges are ‘moving’ in any absolute sense: it all depends on our frame our reference. But… Yes? Then if we put an electric charge in these fields, the force on it will also be different? Yes. Forces also look different when moving from one reference to another. But… Yes? The physical effect surely has to be the same, regardless of the reference frame? Yes. The point is that, if we look at an electric charge q moving along a current-carrying wire in a coordinate system at rest with respect to the wire, with the same velocity (v0) as the conduction electrons (v), then the whole force on the electric charge will be ‘magnetic’: F = qv0×B and E = 0. Now, if we’re looking at the same situation from a frame of reference that is moving with q, then our charge is at rest, and so there can be no magnetic force on it. Hence, the force on it must come from an electric field! But what produces the electric field? Our current-carrying wire is supposed to be neutral! Well… It turns out that our ‘neutral’ wire appears to be charged when moving. We’ll explain – in very much detail – why this is so later. Now, you should just note that “we should not attach too much reality to E and B, because they appear in different ‘mixtures’ in different coordinate systems”, as Feynman puts it. In fact, you may or may not heard that magnetism is actually nothing but a “relativistic effect” of electricity. Well… That’s true, but we’ll also explain how that works later only. Let’s not jump the gun. 2. The remark above is related to the other ‘obvious’ thing I wanted to say before presenting Maxwell’s equations: fields are very useful to describe what’s going on but, when everything is said and done, what we really want to know is what force will be acting on a charge, because that’s what’s going to tell us how that charge is going to move. In other words, we want to find the equations of motion, and the force determines how the charge’s momentum will change: F = dp/dt = d(mv)/dt (i.e. Newton’s equation of motion). q(v×B) is the ‘magnetic’ force: that force depends on both v as well as on B. 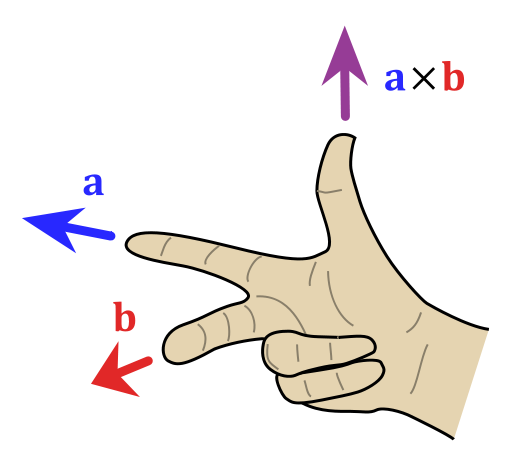 Its direction is given by the so-called right-hand rule for a vector cross-product (as opposed to a dot product, which is denoted by a dot (·) and which yields a scalar instead of a new vector). That right-hand rule is illustrated below. Note that, if we switch a and b, the b×a vector will point downwards. The magnitude of q(v×B) is given by |v×B| = |v||B|sinθ (with θ the angle between v and B). We know the direction of v (because we’re talking about some charge that is moving here) but what direction is B? It’s time to be a bit more systematic now. 2. The concept of circulation is linked to the idea of some net rotational motion around some loop. In fact, that’s exactly what it describes. I’ll again use Feynman’s illustration (and description) because I couldn’t find anything better. OK. So far, so good. Back to electromagnetism. We’re familiar with the electric field E from our high school physics course. Indeed, you’ll probably recognize the two examples below: (a) a (positive) charge near a (neutral) conducting sheet, and (b) two opposite charges next to each other. Note the convention: the field lines emanate from the positive charge. Does that mean that the force is in that direction too? Yes. But remember: if a particle is attracted to another, the latter particle is attracted to the former too! So there’s a force in both directions ! Note we’re talking a closed surface here, like a sphere for example–but it does not have to be a nice symmetric shape: Maxwell’s first equation is valid for any closed surface. The expression above is Coulomb’s Law, which you’ll also surely remember from your high school physics course: while it looks very different, it’s the same. It’s just because we’re using that flux concept here that we seem to be getting an entirely different expression. But so we’re not: it’s the same as Coulomb’s Law. That’s not the same, you’ll say. Well… Yes and no. It’s the same really, but the zero on the right-hand side of the expression above says there’s no such thing as a ‘magnetic’ charge. Hmm… But… If we can’t create any flux of B, because ‘magnetic charges’ don’t exist, so how do we get magnetic fields then? Well… We wrote that above already, and you should remember it from your high school physics course as well: a magnetic field is created by (1) a moving charge (i.e. a flow or flux of electric current) or (2) a changing electric field. One last point perhaps: what’s the direction of the circulation? Well… There’s a so-called right-hand grip rule for that, which is illustrated below. OK. Enough about this. Let’s go to situation (2): a changing electric field. That effect is usually illustrated with Faraday’s original 1831 experiment, which is shown below with a more modern voltmeter 🙂 : when the wire on one side of the iron ring is connected to the battery, we’ll see a transient current on the other side. It’s transient only, so the current quickly disappears. That’s why transformers don’t work with DC. In fact, it is said that Faraday was quite disappointed to see that the current didn’t last! Likewise, when the wire is disconnected, we’ll briefly see another transient current. So this effect is due to the changing electric field, which causes a changing magnetic field. But so where is that magnetic field? We’re talking currents here, aren’t we? Yes, you’re right. To understand why we have a transient current in the voltmeter, you need to understand yet another effect: a changing magnetic field causes an electric field, and so that’s what actually generates the transient current. However, what’s going on in the iron ring is the magnetic effect, and so that’s caused by the changing electric field as we connect/disconnect the battery to the wire. Capito? Let me quickly mention the presence of absence of that c2 or 1/c2 factor in the previous equations once again. It is interesting. It’s got nothing to do with the units. It’s really a proportionality factor: any change in E will only cause a little change in B (because of the 1/c2 factor in the first equation), but the reverse is not true: there’s no c2 in the second equation. Again, it’s got to do with magnetism being a relativistic effect of electricity, so the magnetic effect is, in most cases, tiny as compared to the electric effect, except when we’re talking charges that are moving at relativistic speeds (i.e. speeds close to c). As said, we’ll come back to that–later, much later. Let’s get back to Maxwell’s equations first. Huh? What’s that? Well… The four equations are the equations we explained already, but this time in mathematical notation: flux and circulation can be expressed much more elegantly using the differential operator ∇ indeed. As for the solutions to Maxwell’s set of equations, you can see they are expressed using two other concepts: the scalar potential Φ and the vector potential A. Now, it is not my intention to summarize two dozen of Feynman’s Lectures in just a few lines, so I’ll have to leave you here for the moment. Huh? What? What about my promise to show that magnetism is a relativistic effect of electricity indeed? Well… I wanted to do that just now, but when I look at it, I realize that I’d end up copying most of Feynman’s little exposé on it and, hence, I’ll just refer you to that particular section. It’s really quite exciting but – as you might expect – it does take a bit of time to wrestle through it. This entry was posted in Physics and tagged electromagnetism, Maxwell's equations. Bookmark the permalink. Oh, now, I remember when my physics teacher showed how the changing electric field of moving particles could produce a magnetic field, showing the calculations off, and it was just stunning, almost magical watching this logical consequence falling out of the equations.